The Chemical Dosing Pump articles provides guidance and review about different types, qualities, durabilities, and prices. Chemical dosing pump is used to pump the chemical fluids across the required medium. Dosing refers to feeding chemicals in a particular time interval. The chemicals can react in a much effective way when feeding at the right interval of time. We might have come across the term of the dose when doctors prescribe us the medicines. Dosing pump is used to inject a measured quantity of chemicals into the substances. Chemical dosing pumps usually pump very small quantities of fluid. Dosing is precision work and one of the main tasks in chemical and process engineering and water treatment. The dosing pumps are small in construction and are powered by small electric motor usually. They can be controlled by the external control system or internally programmed to alter the flow rate and on/off function as per the need. The dosing pump mainly finds its application in agricultural industry, medicine, and manufacturing industries. The main function of a dosing pump is to take a certain measured quantity of chemicals and inject them in the required medium. The dosing pump is mainly made of the following components as follows. Chemical tank – tank contains the chemicals or the fluids that are to be dosed. Foot valve – it is a one-way valve placed to avoid the backflow of the fluid. And it is placed at the suction line of the pump. Pump - The suction line is attached the pump and through which the chemicals are sucked into the pump. Injector- the chemicals that are coming from the discharge of the pump flows through the injector connected. An Injector is used to transfer the measured amount of the chemicals into the required medium. The Injector also acts as one-way valve thereby stopping the chemicals from flowing back to the pump. Control system – Control system controls the flow rate of chemicals across the pump in the required time interval in an accurate manner. Control system also contains float switches and sensors so to determine if the desired flow rate and time interval are achieved. If not, they recalibrate the flow rate and timing interval. 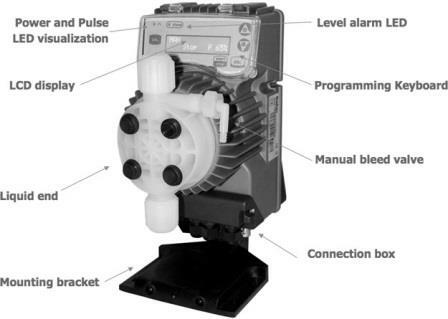 It is the most complex system in the chemical dosing pump. Flow rate – Quantity of chemicals to be pumped into the required medium. Dosing pumps should never be oversized due to precision flow requirements. The flow rate is expressed in terms of volume per unit time. The flow rate is measured as Gallons per minute (GPM). Chemical composition – Chemicals must be checked whether they cause damage to pump like corrosion, erosion and if any chemical reaction happens to the walls of the pump. Viscosity – Viscosity is the resistance to flow. The chemicals viscosity needs to be assessed to determine the smooth flow of the chemicals. Highly viscous fluids need special arrangements to flow across the pumps. Environmental conditions such as pump contact with water, air, chemicals reaction with the environment and the safety standards must be maintained. Chemical dosing pumps are used in wide range of industries starting from the agriculture, medicine, mining, food processing, manufacturing to the thermal power plants. Now let us look at few applications of the chemical dosing pumps. Swimming pools- they are used to maintain the pH value of water, chlorine quantity and to maintain the water quality. Chemicals are kept in a separate dosing tank and are injected by the control system. Textile industry – used in the process of chemical dyeing and chemical treatment of the clothes. Food industry – they are used to add food recipes and to maintain the food safety to mix food components at the desired rate. They help to maintain the food composition texture and in turn, helps to maintain the health of the consumers. Water treatment –they are used in heating, cooling, and condensation of water to maintain the water quality. Dosing of biocides and inhibitors in cooling. Agriculture –they are used to add chemicals in the agricultural field to fight the pests and insects. They are also used to dose fertilizers and other growth inhibiting substances in the agriculture. Medicine - they are used to inject the measured amount of the chemicals into the body during to keep the patient in a dizzy state. Alkalis and acids are dosed using the pumps for better pH control. Power station –they are used to inject the chemicals into the boiler and the feed water to make up the water pressure. They are injected in very small quantities. Building- They help in injecting the inhibitors in the pipe works and the components to prevent degradation or corrosion. Chemical dosing pumps are manufactured by the following companies such as IFS solutions, Neptune Chemical Pump corp., Tolexo corporation, Water Treatment products Ltd. and ShunMing Co. Ltd. These pumps are little expensive due to their precision requirement. They cost in the price range of 300$-400$ for small pumps to the price of around 1000$.These pumps are usually used in low flow rate applications.